New to Meditation? Don't know what to expect? Don't worry! Our drop-in style meditation classes are great way to learn how to meditate. The lessons are easy to understand and the people are warm and welcoming. We offer classes in six locations. Find a day and time that works for you! Everyone Welcome. Life can be so busy and our mind just gets busier and busier. With the influence of technology it’s so easy to become distracted in every situation. (Maybe you already got distracted!?!) As a result we can easily feel scattered and exhausted at the end of the day. How can we change this and reclaim a balanced and peaceful mind? Can we fight for what we believe in without anger? Does letting go of anger mean letting go of power? Do we overcome enemies with anger? Is anger ever justified? This series of classes will answer all these questions and open your mind to new perspectives that you may have never considered before. Karma & Reincarnation: What Is It All About? This series will decode it all, making it easy to understand and practically relevant to our daily lives. By learning about karma we learn how to overcome personal limitations, live happily and create good fortune. There is a close connection between our mind and our breath. By patiently practicing simple breathing meditations you will discover an inner peace just by controlling the mind. Join us to learn different breathing meditations, how to develop a more focused positive attitude, and how to carry peace into your daily life. Save the date! Please note the event location. Pre registration & member discounts apply. Everyone is welcome to the US National Kadampa Festival, a truly amazing event to lift your spiritual life to the next level. Join people from across the country to develop meaningful experiences of Dharma, Buddha’s teachings, which can then be brought into our daily lives.Empowerment of Medicine Buddha and Teachings on healing ourselves and others with Gen-la Kelsang Jampa! The world is crazy place and the mind can be too! Lock yourself in to the temple for 24 hours and get powered up with Buddha Tara’s blessings. Over 24 hours we will practice 6 sessions of Tara chanting, requesting her swift blessings for good fortune in our life and peace in our world. Meditation For People Who Can't Meditate! Join us for an introductory course designed especially for beginners! In this course you will learn how to meditate and the Buddhist approach to training the mind. This course is perfect for those who struggle with meditation! Connect with your own potential for inner resilience and unshakeable happiness, no matter what happens around you. During this special weekend event, Gen-la Jampa will explain the methods to build a strong foundation for happiness and confidence within your own mind. At this Festival, Gen-la Khyenrab will grant the blessing empowerment of Buddha Vajrasattva and explanation of a profound Tantric purification practice. Muchas personas sufren de estrés y ansiedad o se sienten abrumadas con las demandas de la vida diaria. En esta charla pública, exploraremos prácticas de meditación derivadas de la tradición budista que nos ayudarán a mantener paz en tiempos difíciles y a lidiar con nuestras emociones dolorosas o negativas. Save the date, and tell a friend! Pre registration & member discounts apply. 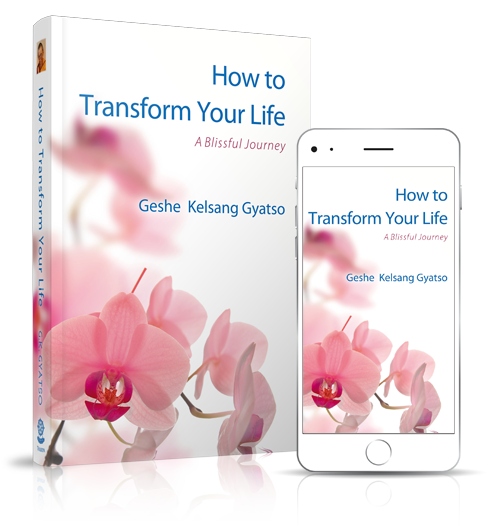 This free gift to the world is perfect for those seeking greater happiness, peace, and solutions to problems of everyday life. Follow the link to download your free copy today!